Many people may be surprised to learn that one of Southern California's chief exports over the last 100 years, besides motion pictures, has been oil. Like oil reservoirs in Texas, Louisiana, and Pennsylvania, a hint of what lay beneath the surface could be seen in the many above ground oil seeps. These seeps had been known by Native Americans for thousands of years. In 1543, the famous Spanish explorer Juan Cabrillo noticed the native people using the naturally occurring tar, or "pitch", to waterproof their canoes. These seeps were also responsible for the tar pits of La Brea (Spanish for "pitch"), which had, over many thousands of years, trapped unsuspecting animals and their predators looking for an easy meal. In 1865, only 6 years after "Colonel" Edwin Drake's monumental discovery in Pennsylvania, California's first productive well was drilled by the Union Matolle Company in California's Central Valley. This area, east of San Francisco, became the scene of much of the drilling activity through the rest of the 1800's. While none of these wells were considered major strikes, they did provide enough oil for the nearby market of San Francisco, by far the largest population center in California in the late 1800's. But the largest fields lay undiscovered, near the sleepy seaside village of Los Angeles. The first well to strike oil in Southern California was drilled in 1892 by Edward L. Doheny, an unsuccessful gold and silver prospector, and Charles A. Canfield, his old mining partner. According to legend, Edward L. Doheny was in the downtown area of Los Angeles when he saw a cart whose wheels were coated in tar. When he asked the man where the substance had come from, he pointed to the northeast. Doheny and Canfield examined the area and soon discovered the Los Angeles Field after drilling to a depth of 140 meters (460 feet) at the corner of Colton Street and Glendale Boulevard, near present day Dodger Stadium. It was drilled using the unlikeliest of instruments: a sharpened end of a eucalyptus tree. Within 2 years of the find, 80 wells were producing oil in the area bounded by Figueoa, First, Union and Temple Streets. By 1897, the number of wells increased to 500. The first gusher to come to California was the Adams No. 16, a well in Adams Canyon in the Ventura basin, which spouted over the top in 1898. This well was followed in February, 1899 by the bigger Adams No. 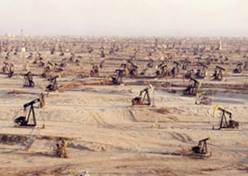 28, which flowed out of control at about 1,500 barrels per day to send torrents of oil down the Santa Clara River and out to sea. This began the legend of Ventura Basin, which would produce some of the biggest gushers in California. Ventura has had a long history of oil drilling, being known once as the only place west of the Mississippi to find oil, a theory that was of course wrong. The first field discovered in the Ventura Basin was Santa Paula in 1861. As the gold rush began to fade, thousands of people, looking for work, began to descend on the remote oil fields in California, but mostly they came to the Ventura Basin. It was here where companies like SHELL and EXXON would first begin their drilling and where the foundations for those successful companies would be formed. Since 1861, approximately 96 oil and gas fields (depending on how accumulations are grouped) have been discovered, 66 of which have ultimate recovery greater than 1 million barrels of oil. Nine gas fields are present along the Santa Barbara coast, but most of the province contains oil accumulations localized along several major anticlinal trends. The most productive is the Rincon trend with several very large Pliocene accumulations. The largest is made up of three giant fields, Ventura Avenue, Rincon, and San Miguelito, whose combined ultimate recovery is estimated at over two million barrels a year. Several other important anticlinal trends also contain giant fields. The most recent new field discovery in the onshore area of the province is Rincon Creek found in 1982. New drilling has mainly focused on locating new pools and extending existing fields, with very minor exploration outside of existing fields. In the offshore, where most exploration has focused since the late 1950's and early 1960's�although limited by State and Federal leasing regulations�the most recent new field discovery in State waters is Santa Clara, found in 1971. Ventura would produce many gushers, due to it�s temperature. Because petroleum generation is a chemical process, it is strongly temperature-dependent. This explains the strong increase of the hydrocarbon/noncarbonate carbon ratio at greater depths, where the temperature is higher. It also explains the greater depth of oil generation and of equality of shale and oil hydrocarbon composition in the Ventura basin compared with the Los Angeles basin because as anyone knows, Ventura is much hotter then Los Angeles.